What makes my house feel like home? It’s the various keepsakes and artwork my family has picked up (and created) over years, the colors and furnishings that feel welcoming and, being a geek, the technology that takes care of my family of five. For instance, when I get up in the morning, my first conversation is often with our digital assistant. I ask it to turn on the lights, tell me what the weather is going to be like and play my personalized news briefing. And my kids enjoy using it as much as I do, especially for playing their favorite songs on command. And a smart home will ensure that you never walk into a dark house, with smart lights that turn on with motion sensors or are triggered by your phone when you’re approaching your house. Your smart home’s thermostat will make sure that your home is always cool in the summer and warm in the winter, while saving energy when you’re away. And your smart home’s camera’s will alert you when there’s a package left at the front door or someone enters your pool area unexpectedly. The beauty of smart home technology is that it can be tailored to fit your family’s specific needs. And with voice recognition, any member of the family can engage with your home. If all this talk about smart homes has gotten you thinking about your next house, Capital One’s Simply Smart Home Loans can make the process of financing your new home easy. You can get pre-qualified for a home loan within minutes, with no impact to your credit score, so you’ll know just how much house you can afford. You’ll be assigned a home loan officer to help you through the mortgage process. And with Capital One’s online tools, you’ll be able to track your progress anytime and upload and sign documents electronically. Want to find out how smart you are about the home buying process? You can take the Capital One Simply Smarter Home Buying Quiz. 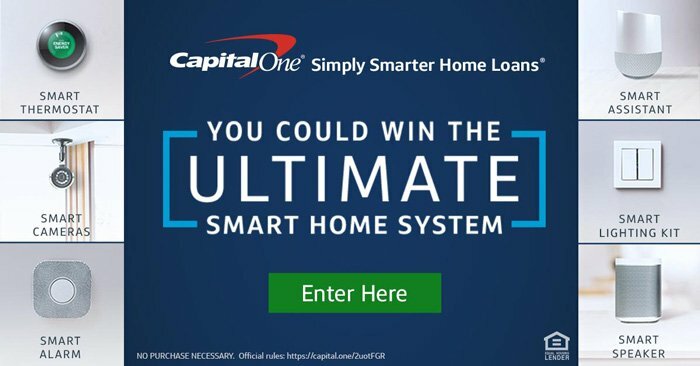 In addition to providing customers with a smarter way to buy and refinance their home, Capital One is giving away ultimate smart home systems, with lighting, cameras, thermostat, security features and a smart assistant in the Simply Smarter Home Sweepstakes – a total value of $2,785!One Grand Prize Winner and two First Prize Winners will be announced weekly, starting July 10, 2017 and running through August 21, 2017. The Grand Prize Winners will receive one (1) Google Home, one (1) Nest Protect smoke alarm, three (3) Nest indoor cameras, two (2) Nest outdoor cameras, and one (1) Caseta wireless lighting control kit, and a check made payable to the winner for $700. And, the First Prize Winners will receive (1) one Google Home ($129). You can return daily to increase your chances.